An active accompanying persons program has been arranged for ICA 2013. Many events, including Monday's city bus tour, are included in the accompanying person registration fee. Additionally, several tours have been arranged through a local service. Opening Ceremony in room 517cd on Sunday at 5:00 p.m. Expect a spectacular start to ICA 2013. The ceremony will be followed by a Welcome Reception in the Panoramic Room on the 7th floor of the Palais. Each morning, the Accompanying Persons room 520a will be open from 8:00 a.m. to 10:30 a.m. A light breakfast buffet will be available. On Monday morning, a representative from Tourisme Montréal will present local attractions, events and a brief history of Montréal. You can visit Tourisme Montréal for a preview. On Monday morning, a representative from VDM Global will also be available to discuss the tours that they are handling for the Accompanying Persons. Monday afternoon features a city bus tour. There is no charge for this tour. Registration for the tour will take place on Monday morning from 8:00 a.m. to 10:30 a.m. in the Accompanying Persons Room(520a). See the VDM Global representative to sign for the tour. The buses will leave from the Viger Hall bus roundabout at 1:30 p.m. Closing Ceremony will be in room 517cd on Friday afternoon at 3:00 p.m. The ceremony will be followed by a Farewell Reception in the adjoining 517ab.This reception will be co-hosted by the Argentina Acoustical Society who will be organizing ICA 2016. Several additional tours will be available for which Accompanying Persons can register individually. These are operated by VDB Global, our tour management host. Register for these online at the VDM Global Website as soon as possible. These tours are listed below with brief descriptions; get fuller information at the VDM Global website. Pre-tour of Québec City, Saturday 1 June (minimum of 20). Classified as an international heritage site in 1985 by UNESCO, the city of Québec, capital of the Province of Québec, is the only remaining entirely fortified city in North America. Founded in 1608 by Samuel de Champlain, Québec was the first permanent European settlement in New France. Pre-tour of Ottawa, Saturday 1 June (minimum of 20). With the help of a professional guide, drive along Sussex Drive, the Byward Market, and the Rideau Canal and discover the many historical and charming facets of Canada's capital city. You will have free time for lunch on your own in the Byward Market. 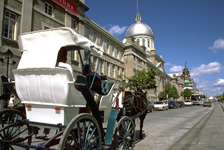 Flavors and aromas of Old Montréal, a walking tour on Tuesday 4 June (minimum of 10). This walking tour will allow you to discover the delicious cultural and historic culinary charms of the oldest district of Montreal. Specialty shops and boutiques in the area are housed in old factories and showrooms from the 19th century. Tour of the Olympic district, Wednesday 5 June (minimum of 35). Wander through four full-scale natural ecosystems of the Americas at the Biodôme, a unique concept of a "living" museum; then, see the Olympic Tower and the buildings constructed for the 1976 Olympic Games, and ride the Funicular to the top of the world's tallest inclined tower to admire the view of Montréal and the river; finally, visit the second largest Botanical Garden in the world displaying 20,000 species of flowers and plants in 30 outdoor gardens and 10 greenhouses. The cut-off date for online registration is 24 May 2013. At this time, a decision will be made concerning the two pre-tours; they will be cancelled if the minimum numbers of participants are not reached. For the other two tours, onsite registrations will be accepted during the morning of Monday 3 June in the Accompanying Persons room.